New Jersey Psychological Association (NJPA) is approved by the American Psychological Association to offer Continuing Education (CE) credit for psychologists. NJPA may decide to co-sponsor a program with an outside organization. Co-Sponsorship is the mutual planning of an activity by two or more organizations, which is not to be construed as lending or transferring approval status. Please take the time to review the below information on this website page as you consider your request for the mutual planning of a continuing education program. Please review all the information on this page prior to submitting an application for CE co-sponsorship. 1. An NJPA member, affiliate or outside group applying for co-sponsorship must produce a completed application at least 60 days prior to the program. THE PROGRAM MAY NOT BE ADVERTISED IN ANY FORM BEFORE IT IS APPROVED BY NJPA. You will be contacted by the NJPA CE and Event Manager, after your application is reviewed, to notify you about the status of your application. Due to the large amount of applications received by NJPA, we cannot give an estimated time-frame for review. Please adhere to the submission specification of 60 days prior to the program. Applications submitted after the 60 day window will not be reviewed or considered for CE sponsorship. 2. Outside groups are charged a $350 non-refundable application fee for 1-4 Workshops Per Application. Please click here for additional Outside Group pricing terms. NJPA member or affiliates are not charged an application fee. 3. The NJPA member, affiliate or outside group applying must produce a program coordinator’s name and contact information. This individual will be responsible for the program attendance sheets, which must be sent to the NJPA CE and Event coordinator, and distributing the link to the evaluation form along with instructions on completing the evaluation form to the attendees. NJPA affiliate CE program participants will be charged a fee for CE certificates of $15 for NJPA members, $25 for non-members, and free for NJPA Sustaining Members. Presenters of NJPA co-sponsored programs need to refer to the Board of Psychological Examiners Regulations 13:42-10.21(b)(4) to learn about earning credit for presenting a new lecture or seminar to professional peers, and section 13:42-10.22(b)(5) to learn about the required documentation. 4. At the beginning of the program, NJPA affiliate or outside group’s program coordinator must require all attendees sign the attendance sheet, and distribute the link and instruction sheet for the evaluations. When applicable, NJPA co-sponsors should explicitly state, at the beginning of the program, that confidential material may be discussed, and should review with the participants the limits of that confidentiality. 5. At the end of the program, the NJPA affiliate or outside group’s program coordinator must collect the attendance sheets. Attendance sheets must be emailed to Ana DeMeo, CE and Event Manager, at [email protected] The attendees must follow the instruction sheet for the evaluation. They must pay for the CE certificate and will then receive a confirmation email with a link to the evaluation. The evaluations must be received within 7 days of the program date. Each year, NJPA is obligated to provide APA with an annual report detailing all NJPA co-sponsored and sponsored programming including the attendance record for each program and an accounting of how many psychologists attend each program and obtained continuing education credit. 6. NJPA members and affiliates can email a marketing flyer/information to Ana DeMeo. NJPA will promote the program for free on our Friday Update and Event Calendar. Outside organizations can take advantage of our low-cost Event Package found here. 2. Facilitate the integration of practice and research to foster and sustain an active sense of critical inquiry. NJPA CE activities must conform to the highest ethical standards available to psychologists. Co-sponsors must conduct and promote CE activities in a responsible and ethical fashion following the principles set forth in the current APA Ethical Principles of Psychologists. A link to the APA guideline can be found here. Promotional materials must demonstrate careful consideration of ethical principles (e.g., content of presentation, credentials of presenters, facilities, conduct of the activity, etc.). Clear statements must be provided on policies and practice relevant to cancellations and refunds. A method for obtaining information about your program must be clear (e.g. providing a phone number to call for further information). Any demonstrations or procedures carried out by instructors and/or participants must conform to the highest ethical and professional standards as currently established by the APA Ethical Principles of Psychologists. All aspects of the CE program must maintain awareness of and sensitivity to individual differences among people, such as those that may be associated with age, gender, sexual orientation, socioeconomic, ethnic and religious background, psychological vulnerability, and physical handicap. Claims made that imply new, innovative, or breakthrough types of findings should be defined as such to potential participants and may require substantiation via empirical data. Sensitivity to, and compliance with, ethical principles of nondiscrimination must be evident in staff hiring, processes of selecting participants, and faculty selection. The principle of confidentiality of instructional materials and participant disclosure, if any, must be maintained. When applicable, APA-approved sponsors should explicitly state at the beginning of the program that confidential material may be discussed, and should review with the participants the limits of that confidentiality. They should follow APA Standard 4.07: Use of Confidential Information for Didactic or Other Purposes, which states: Psychologists do not disclose in their writings, lectures or other public media, confidential, personally identifiable information concerning their clients/patients, students, research participants, organizational clients or other recipients of their services that they obtained during the course of their work, unless (1) they take reasonable steps to disguise the person or organization, (2) the person or organization has consented in writing, or (3) there is legal authorization for doing so. Workshop participants should be informed if a presentation may be particularly stressful or upsetting. CE credit will only be earned for participation in activities that have specific learning objectives and that evaluate the extent of learning that has taken place according to those objectives. One credit is awarded for each hour of the CE activity. 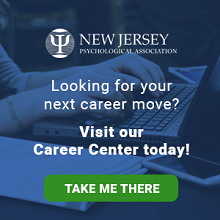 As an APA-approved sponsor of CE for psychologists, NJPA must adhere to established criteria and must require the same of any institutions or presenters who seek co-sponsorship with NJPA of their CE programs. What types of CE offerings are considered "homestudy?" • Homestudy is defined as any program or activity where there is no ability for live interaction. Examples include pre-recorded webinars and reading material approved for CE credit. Can instructors get CE credit? • Yes. For presenting a new lecture or seminar to professional peers, or teaching or developing the curriculum for a new CE course or program related to psychology. New means the licensee has never presented the seminar/lecture before or taught/developed curriculum for that course in any other educational setting. Instructors will earn one credit for each 50 minutes of the lecture/seminar/course/program up to 5 credits. Instructors do not need to be psychologists however they must have expertise in the content area and be competent to teach the program at a level that builds upon a completed doctoral program in psychology. Also, a doctoral level psychologist must be involved in all aspects of program planning and development. Is it acceptable to provide certificates of attendance to participants who are non-psychologists? • Yes. All participants attending the full length of your program may request a certificate of attendance. However, it is recommended that participants check with their respective state board to ensure that credits obtained will be accepted. Does the CE program administrator have to be a psychologist? • No. However, doctoral level psychologists must be involved in all aspects of program planning and development. Is it required that instructors be psychologists? • No. However, instructors must have expertise in the content area and be competent to teach the program at a level that builds upon a completed doctoral program in psychology. Also, a doctoral level psychologist must be involved in all aspects of program planning and development. Do other professions accept credit earned from APA-approved sponsors? • There are some professions that accept credit from APA-approved sponsors. However, it remains the responsibility of program participants to confirm this with his/her licensing board. Learning objectives, or learning outcomes, are statements that clearly describe what the learner will know or be able to do as a result of having attended an educational program or activity. Learning objectives must be observable and measurable. Learning objectives should (1) focus on the learner, (2) contain action verbs that describe measurable behaviors, and (3) focus on skills that can be applied in psychological practice or other professional environments. Please refer to the Guidelines for Writing Behavioral Learning Objectives at http://www.apa.org/ed/sponsor/resources/index.aspx. 6. Practice hypnotic technique in dyads. Objective learning assessments should be written in a manner that determines whether participants learned what you planned to teach them. The learning objectives should directly apply to the learning evaluation (i.e. learning assessment) of participants.The evaluation (or learning assessment) should be based on the stated learning objectives of the program, and should include a focus on application of skills to the psychology practice or other professional environment. To Read the APA Standards and Criteria for Approval, August 2015, click here. • APA Standard A requires the programs are relevant to psychological practice, education, and/or science; enables psychologists to keep pace with the most current scientific evidence regarding assessment, prevention, intervention, and/or education, as well as important relevant legal, statutory, leadership, or regulatory issues; and allows psychologists to maintain, develop, and increase competencies in order to improve services to the public and enhance contributions to the profession. • APA Standard B requires that there is direct input of psychologists in all phases of the decision-making and program-planning process for the activities offered to psychologists for CE credit. • APA Standard C requires a clear statement of educational objectives; the use of appropriate educational methods that are effecting in achieving those objectives; a clear connection between program content and the application of this content within the learner’s professional context; and the selection of instructional personnel with demonstrated expertise in the program content. • APA Standard D requires that the CE programs must be grounded in an evidence-based approach. CE programs that are focused on application of psychological assessment and/or intervention methods must include content that is credibly supported by the most current scientific evidence. CE programs may also provide information related to ethical, legal, statutory or regulatory policies, guidelines, and standards that impact psychology. • APA Standard E requires an assessment of the program through a program evaluation. • APA Standard F covers APA standards for awarding credit. • APA Standard G covers promotion and advertising of programs. In general, there are no concrete rules regarding labeling the content of CE programs as introductory, intermediate, or advanced. It is important for sponsors to evaluate the level of their programming effectively so the learner understands the level at which information will be presented and for the sponsor to develop learning objectives that are consistent with that level. All CE programs must address content at the post- doctoral level. However,there are differences between the levels of programming that can be considered. Introductory – Content is designed for psychologists who may have little to no background in a specialized skill or content area. Through this level of programming, the learner can become acquainted with the theoretical underpinnings, principles, methods, and perspectives of a content area. An introductory level program also may serve as the foundation for subsequent intermediate and advanced learning. Introductory level programming may also be related to an emerging area of knowledge or practice. Although this content can be used as a foundation for more advanced learning, an introductory level program may simply focus on breadth, enrichment or general knowledge. Intermediate – Intermediate level programming builds upon the learners’ foundational knowledge in a content area. Programming at the intermediate level includes more depth than that which is associated with a beginning level program. The program of instruction can build on the learners’ familiarity with the literature and/or experience. Programming can help the learner understand applications and limitations of theories and applied skill sets. Intermediate level programming may also focus on an integration of skills. This programming could also serve as a refresher course for individuals who have background in a content area and are interested in learning more contemporary applications.